This book has all the information you'll need to learn how to build a sturdy, elegant sea kayak, from setting up shop to making a paddle. This book, written by Nick Schade, the designer behind Guillemot Kayaks, describes how to build a rugged and beautiful sea kayak using strips of wood, fiberglass and epoxy. At 200 pages it is richly illustrated with photographs and drawings, making each step of building clear and understandable. Three different kayak designs are included in the book: an easy to build, easy to paddle single; a beautiful, high performance single; and a comfortable, stable tandem. The strip-building process, some times called wood-strip or cedar-strip/epoxy, is very forgiving. A first time builder can be confident of creating a boat that functions well and looks beautiful even if they make mistakes. Not only can you construct a beautiful water craft, you can go beyond, to a crafting a functional work of art. The book provides instructions in techniques for bringing your craft to that next level. On these web pages you will find information about the book, supplements, additions, and corrections (there are bound to be some) and answers to your questions. 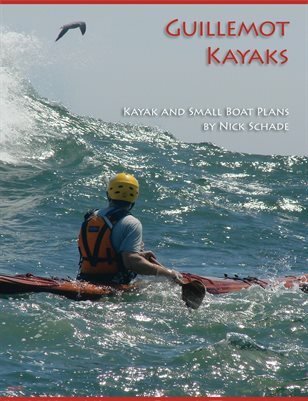 If you purchase a copy of The Strip-Built Sea Kayak through Guillemot Kayaks you will receive the latest copy of Nick Schade's Kayak Building Notes.